I made these for the high tea we had at Melissa and Simon’s a few weeks ago. I also made mini versions at Christmas but hadn’t posted the recipe as I wasn’t able to get a photo to share with you until now! Preheat oven to 180°C. Sift together flour, baking powder and salt in in a bowl. In a separate large bowl beat the butter, cinnamon and sugar until light and fluffy, add the egg and vanilla and mix well. Add the flour mixture to the wet mixture in three additions, alternating with two additions of milk. Beat lightly after each addition just enough to combine the ingredients. 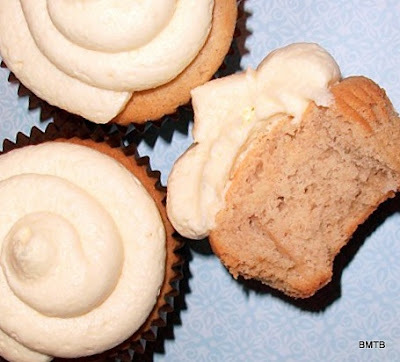 Divide the batter between 12 medium cupcake papers so that each is ⅔ full. Bake for 15-20 minutes or until you can remove a skewer cleanly. Cool completely before icing. I recommend icing with a vanilla buttercream. These look delish! Will need try them soon.